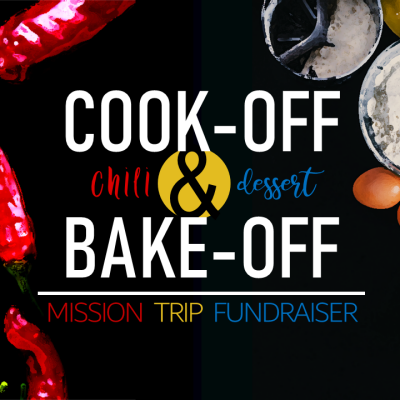 Chili cook-off & dessert bake-off at FBC hosted by the Nepal Mission Trip team. Everyone is welcome to come out for this family friendly event. Come enjoy a variety of chili recipes & desserts and then vote for your favorite. Hot dogs and sides will also be served. Free will donations will be accepted to support of FBC’s Nepal Mission Trip this spring. To enter into the Chili Cook-Off and/or the Dessert Bake-Off SIGN UP HERE. Participants must plan to bring a minimum of 8 quarts of chili and a minimum of 50 servings of dessert depending on what competition they’re entering.